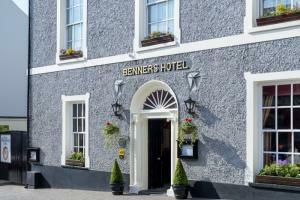 Dingle Benners Hotel captivates guests with its old world charm and elegance. The hotel offers guests the best of both worlds - traditional Irish warmth and comfort coupled with the best of modern facilities. The hotel offers 52 luxuriously appointed guestrooms and puts a wide variety of attractions and restaurants at your doorstep. Located in the heart of Dingle Town, about an hour away from Kerry Airport, close to restaurants and activities. Breakfast at Benners, Mrs. Benners Bar. Golf, Whale and Dolphin Watching, Kayaking, Windsurfing, Dingle Dolphin Boat Tours, Dingle Oceanworld.